Philadelphia Flyers captain Claude Giroux notched two points — including the game-winning overtime goal — to lead the Flyers to a 3-2 triumph over the visiting Winnipeg Jets Monday night. Giroux scored his 22nd goal of the season with only 13.6 seconds remaining in overtime. He now has seven overtime goals in his career, surpassing Simon Gagne for the Flyers all-time record. After a Dustin Byfuglien shot missed the net wide in the Flyers’ end, Giroux led a 2-on-1 with defenseman Shayne Gostisbehere down the ice. Giroux tried centering the puck to Gostisbehere but Winnipeg’s Mark Scheifele made an impressive play to deflect it out of mid-air. However, Gostisbehere dove to maintain possession, pulling the puck between Scheifele’s legs, settling it with his glove and then pushing it to his stick to pass to a wide-open Claude Giroux in front of the net. Giroux was 1-on-1 with Jets goalie Ondrej Pavelec and beat him glove side. The Flyers faithful were not even sure Giroux would play this evening, as he was one of only a few players who did not take part in Monday’s optional morning skate after appearing to be knocked unconscious on the ice Saturday against Arizona. Giroux was hit from behind by Martin Hanzal and hit his head on the boards and on the ice, but he was able to leave the ice on his own. Not only was Giroux available for Monday’s game, he was dominant, coming up with the clutch goal when his team needed him most. 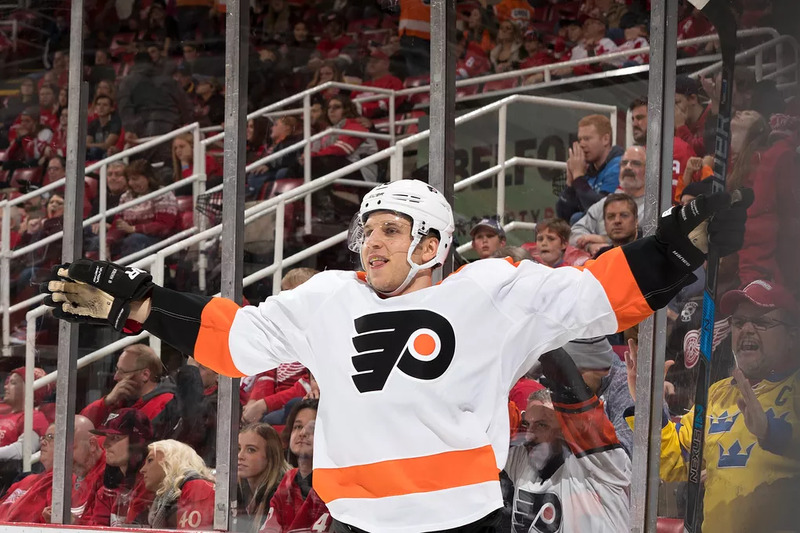 The victory Monday night was crucial for the Flyers, as the team is fighting to hold onto the second wild-card spot in the Eastern Conference playoff race. The Flyers have the most three-on-three overtime experience in the NHL, as Monday was the team’s 25th overtime appearance of the season. Giroux and Gostisbehere have been deadly in the new overtime format all season long. Flyers players and fans alike are thankful for the 3-on-3 overtime format because Philadelphia has been the worst shootout team in the league since the shootout was introduced in 2005.